The Mill Creek K9 Unit addresses the priorities of our police department with its unique approach to addressing criminal activity. The new K9 team, affectionately known as K9 version 2.0, includes Officer Nathan Lerman and Bagira, a one-year-old German Shepherd . The presence of its own drug detection K9 team means that Mill Creek will have the availability and flexibility to provide proactive patrol on local trails, in City parks, and throughout neighborhoods. In addition to service in Mill Creek, a dual-certified K9 team will benefit other regional law enforcement partners by assisting on calls. Bagira and his partner, Officer Nathan Lerma, are certified for skills for obedience, tracking and apprehending suspects in fall 2017. K9 Bagira and Officer Nathan Lerma were certified in June 2018 as a narcotic detection team, attaining 100 percent proficiency in the detection of cocaine, heroin, and methamphetamine. 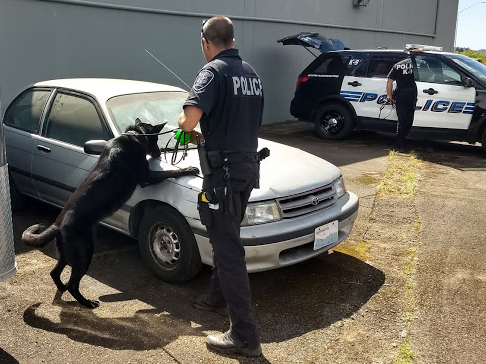 An assessor from the Washington State Patrol certified the Mill Creek K9 team to both Washington Administrative Code 139-05-915 standards as well as standards established by the California Narcotics Canine Association. The CNCA is a recognized nationwide leader in drug detection and certifying to these standards demonstrates our team’s proficiency. The training consisted of 200 hours of classroom and practical applications provided by Code 4 Canine LLC in Centralia. Lerma and Bagira are the first K9 team for the City of Mill Creek to be a dual purpose team. This means they can detect narcotics, as well as track, locate, and apprehend suspects and any evidence the suspect may leave behind. See Officer Lerma and K9 Bagira's demonstration following their most recent certification.